The Troy Rear Folding Battle Sight has set a world standard for design and quality by which all other back up iron sights are judged. 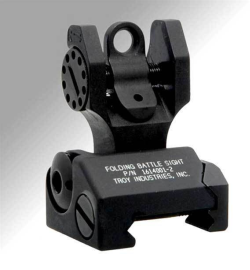 Troy Rear Folding Battle Sight is easily installed and position apertures at the exact same height as the factory sights, with no levers or spring to fumble with. With a Troy Rear Folding Battle Sight the deployment of the sight under stress is easy making it the perfect shooting accessory for you. The robust stainless steel cross locking system ensures your sights will remain up and zeroed in the most extreme combat conditions. To fold the battle sight simply press the release button located on the left side of the sight. The Troy Folding Battle Sight features a zero-canting attachment system for use on all military and aftermarket receivers. No tools are required for adjustment of the Troy Rear Folding Battle Sight, each click on it equals.